That’s where you come in. 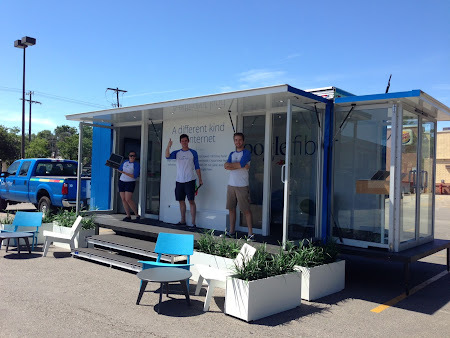 For us to bring Google Fiber to you, we need to know you want us! Each fiberhood will have a sign-up goal. Once you and your neighbors reach your goal, we’ll bring fiber the last mile (or so) from the cabinet to your homes within a few weeks. This process will be transparent — you and your neighbors are in control. Next year, you’ll be able to go online and check a real-time map to see how close your fiberhood is to your goal, and see how other fiberhoods are doing. Plus, you’ll be able to see which local community organizations like libraries, schools and nonprofits (the City is selecting 100) will be getting Google Fiber service for free — as long as the fiberhood they’re in meets its goal. One important thing you should know: you’ll only have a short window of time to sign up for service — probably a few weeks. This is because we focus our energy on a handful of fiberhoods at once, doing an all-out installation and construction blitz. We do this so we can provide you with better, faster service; we won’t make you wait around for a crew that’s stuck in traffic across town. After we’re done in one fiberhood, we’ll move on to the next. Please make sure you don’t miss your opportunity to sign up, because we don’t know when we’ll be able to come back! Unfortunately, the missing detail that I don’t have yet is the date when you’ll be able to sign-up. We’ll let you know when we know — but in the meantime, I will try to write updates for you as I have them. Thanks for your patience, and know that we’re working hard to get Fiber to you as soon as we can! 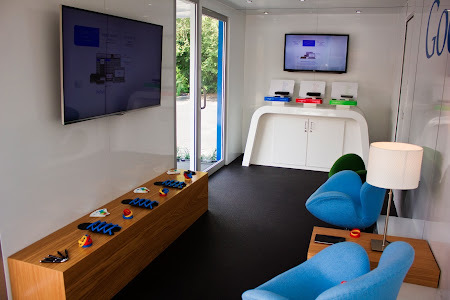 When I first walked into the Google Fiber office, I was surprised by what I found: walls papered with maps of Austin, construction plans for every single neighborhood and a big team of engineers who knew the Austin area better than I. It struck me how much work it takes to build a city-wide network, and also how little my fellow Austinites and I really knew about Google Fiber. So, going forward I’ll share what I can with you, whenever I can, starting today with an explanation of how you’ll actually be able to sign up for service next year. Getting Google Fiber will be a little different than what you might be used to. Google won’t choose which areas get Fiber — you and your neighbors will. , enter your address and choose one of our three Fiber packages. If you sign up over the next month, we hope to have your service installed by Spring of 2014. Our installation crews are moving through Kansas City as quickly as they can — but we know that Spring seems like a long wait. So, if you sign up between November 20 and December 22 and choose our Gigabit + TV plan, you can you pick up your Nexus 7 tablet now (while supplies last), to help you pass the time. The tablet will eventually double as your Google Fiber remote, but we bet that you’ll be able to find some other useful things to do with it in the meantime. Once you’ve signed up for the Gig + TV plan, you can stop by the Google Fiber Space before Dec. 22 to pick up your new tablet. We also have some news for those of you who are in areas that haven’t been able to get Fiber yet. In March, folks in Kansas City, North, South Kansas City, Mo, Gladstone, Grandview and Raytown will be able to start signing up for Google Fiber. Just like our first wave of sign-ups, we’ll divide these areas into small sections called “fiberhoods.” In each fiberhood, a certain number of homes will need to sign up for service in order to qualify their area for Google Fiber — so get ready to rally your neighbors! We’ll have more info to share (along with a map of the fiberhoods) in the beginning of 2014. Questions? Join us next Tuesday, Nov. 26th from noon to 3 PM Central Time on Google+ or Facebook where we’ll be answering questions about signing up for Fiber. Or you can always just give us a call. We’ve heard you — you moved over the past year, you changed your mind, or maybe you just missed your first chance — and you want another opportunity to sign up for Google Fiber. will have a second chance to sign up for Google Fiber. Between now and December 22, you can go to our website, enter your address and choose one of our three Fiber packages. As cold weather is starting to roll through Provo, so are our installation trucks. Over the past week, we began installing Fiber for our first residential customers who are transitioning from the local Veracity Networks service; we hope to finish this first wave of installations over the next six months. For those of you who want Fiber but don’t already have service with Veracity, we’ll open up residential sign-ups in January — enter your email and address on our website to get more info after the holidays! Now even more people can use our app. Visit the Apple App Store to download it today! Do you love and watch just a handful of channels? Now, you can use the channel history “shortcut” feature on your app to quickly reach all of your favorites. You’ll find your channel history in the navigation menu by tapping the icon in top left of the screen. 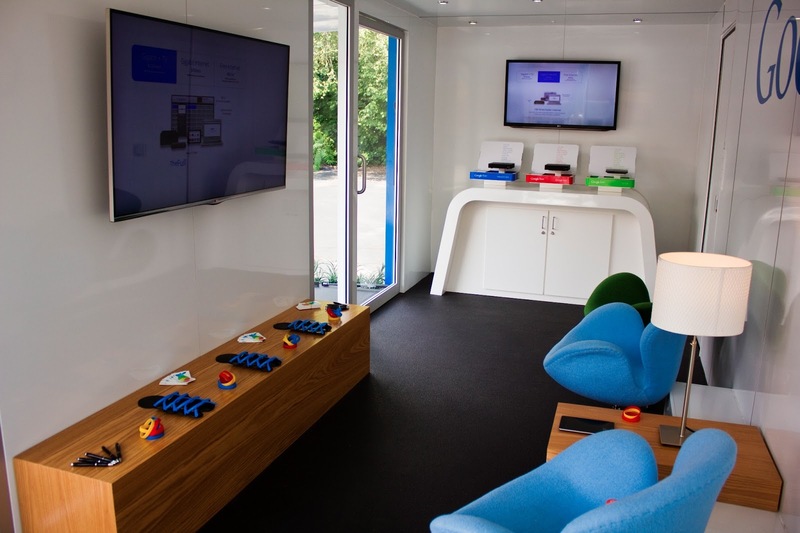 The Google Fiber Storage Box can hold up to 500 hours of HD content. That’s great for those of you who want to record your favorite shows...but once you have 1,000 sitcoms recorded, how do you sift through it all and find the one you want to watch? 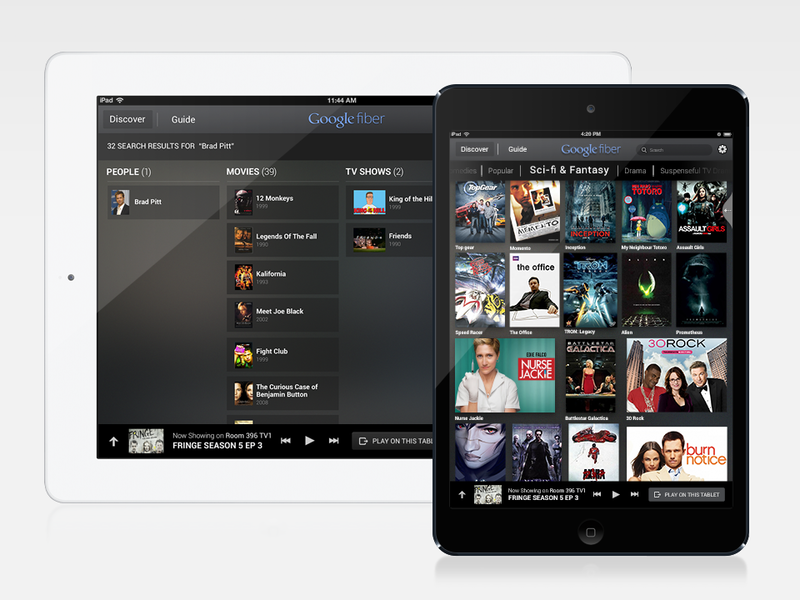 Now, the Fiber app allows you to manage your DVR and find, organize and mass-delete all of your content right from your tablet or phone. To see your existing recordings, open the navigation menu and tap DVR. To quickly setup new DVR recordings, tap the search icon and type (or speak) the show title. Do you have ideas for more features you want to use on the app? We’d love to hear them! Send your “dream features” our way via the Google Fiber help forum.
. Now, we’re thrilled to announce the final few fiberhood deadlines for Kansas City, Kan. and Central Kansas City, Mo. If you live in one of the fiberhoods listed below, don’t miss out. Visit our website today to choose your plan. Almost one year ago, we brought Google Fiber to our first-ever customers. Now, we’re thrilled to announce the final few fiberhood deadlines for Kansas City, Kan. and Central Kansas City, Mo. If you live in one of the fiberhoods listed below, don’t miss out. Visit our website today to choose your plan. WatchESPN provides live access to eight networks, including live events and all of ESPN’s sports and studio shows (including ESPN, ESPN2, ESPNU, ESPN3, ESPN Deportes, ESPNEWS, ESPN Goal Line and ESPN Buzzer Beater). You can watch at no additional cost by logging in with your Google Fiber account — visit WatchESPN.com or download the WatchESPN app from Google Play or the App Store on your Xbox 360, or on Apple TV. WATCH Disney gives you live access to Disney Channel, Disney Junior and Disney XD networks. Just go to WatchDisneyChannels.com and log in using your Google Fiber username and password. If you want to learn more about this feature, you can also visit us at the Fiber Space for a live demo with our team. It’s the 5th time your kids have asked “are we there yet?” from the back seat — but it looks like traffic isn’t going to ease up any time soon. Wouldn’t it be amazing if you could just use your phone or tablet to summon their favorite sports and TV shows, right there in your car? Starting today Google Fiber TV customers can stream boredom away, with the WatchESPN and WATCH Disney apps. From the beginning, Google Fiber was meant to help make the web faster for individuals and families. We’d noticed frustration from users about their home Internet speeds — nobody likes to put their lives on hold as videos buffer, photo albums upload or movies download. We chose to bring a Fiber to homes first, to help make the web there faster, and we’ll have a small business product in the future. What kinds of locations are you connecting to Google Fiber right now? Right now, we’re only bringing Fiber to residential locations (units and homes where people live), plus the public and nonprofit sites selected by each Fiber city through our Community Connections program. Can home-based businesses use Google Fiber? Yes. If you live in and work from your home (e.g. accountant, graphic designer, online tutor, talent agent for clowns), you can use Google Fiber. Just make sure you read through and comply with our terms of service. What businesses need to wait for the Fiber small business product? If the primary use of the location where you want to install Google Fiber is commercial (e.g. nobody lives there), we won’t be able to bring you Fiber service yet. Hang in there for when we have a small business plan! When will you have a small business service available? For now, we’re extremely focused on bringing Fiber to all of the residents who are already signed up and waiting for service. We will have more information about our small business product in the future. Stay tuned to this blog, or enter your address and email address on our website to get more information as soon as we have something to share. Why don’t you have an option for small businesses? Today your Internet and TV service are probably connected to your home via copper wires. This technology has been around for over 100 years, and it just wasn’t built for what we’re trying to use it for today. My job with Google Fiber is to build thousands of miles of brand new fiber-optic cable, which is far better and faster than copper at transmitting information, such as the bits that make up your favorite websites, YouTube videos, video chats, or online games. Fiber-optic cables are made of glass, and they use lasers to transmit information — close to the speed of light! It’s amazing technology, but unfortunately very few homes have direct access to fiber networks today. That’s where my team comes in. Every day, we’re working to plan and build brand new Google Fiber networks in Kansas City and Austin. There are a few big steps. Step 1: Figure out where we can put our fiber. We need to build thousands of miles of fiber — but we can’t just put it wherever we want. First, we use the infrastructure data that the city has shared with us to create a base map of where we can build (existing utility poles, conduit) and where we should avoid (water, sewer and electric lines). Then, a team of surveyors and engineers hits the streets to fill in any missing details. Every mile of this network has to be planned and diagramed, which takes a huge amount of time (imagine planning a network that touches ~30 utility poles per mile, for thousands of miles). We also plan and build backup fiber routes; we want to be ready just in case there's a break in service along any section of our network (it just so happens that squirrels love to chew through fiber lines). Step 3: Build the network. Only once we have a solid plan — including diagrams of every utility pole our fiber will travel on, detailed maps of where we’ll need to dig up streets to install new conduit, and the specs for every single hut and cabinet — can we get boots on the ground to start building our network. That’s when you’ll start to see crews out in the streets with their boom trucks, boring machines, and rolls of conduit and cables. In other words, this is a huge undertaking, and we know you might get a bit impatient with us from time to time. We know you want your Google Fiber — please know that we’ve got our teams hard at work to get you connected just as soon as we can. This is the second post in our “Behind the Scenes” blog series, designed to answer some frequently asked questions about how things work at Google Fiber. Today, our construction manager John Toccalino is going to explain the steps in actually building a Google Fiber network and why it takes awhile. - Ed. When most Americans connect to the Internet from their homes, their signal travels along a local telecommunications infrastructure, currently built mostly of copper cables that run along utility poles or underground. Now that technology has advanced, communities are starting to upgrade to fiber-optic cable that’s better suited to 21st century communications demands, like high-speed Internet. And that involves a lot of detailed planning — utility pole by utility pole and block by block. That’s what Google Fiber teams are working on right now in the Kansas City area, Austin, and Provo. We’re going to tell you more about the actual construction process in a future blog post, but here we want to focus on how we work closely with city leaders before anyone picks up a shovel or climbs a ladder. Access to infrastructure - In order to build a network, we need to string fiber along utility poles or install it underground through protective tubes called conduit. It’s not feasible for each and every provider to build their own poles and conduit — after all, there’s only so much space on city streets, and it'd be an ugly waste of resources to force everyone to put up brand new poles alongside existing ones and dig up city streets unnecessarily. So it's essential that cities ensure that new providers can use existing poles and conduit. We work with the city and, where applicable, the local electric utility and telephone company to figure out which poles and conduit we can use for Google Fiber, then we agree on a fair market price we can pay to lease that space. Access to local infrastructure maps - Once we get permission to lease space on existing poles and in available conduit, we need to know where all of that infrastructure is physically located, so that we can plan where our fiber lines will go. It is critical that the city provide accurate maps about poles and conduit, plus info about existing water, gas, and electricity lines, so that we can know where we can safely build our fiber network. Expedited construction permits - Google Fiber cities need to be ready for the large volume of permits (thousands!) that we’ll be submitting to them. We comply with each city’s permitting code, and we work closely with cities to figure out a way to expedite the permitting process to make sure that they’re comfortable and ready for the planned pace. Our work with the city doesn’t end here. We stay in touch with city leaders and work closely with them throughout the entire construction and installation process to make it as quick and painless for residents as possible — a topic which we’ll cover in our next “Fiber Behind the Scenes” blog post. Today we’re introducing a “Behind the Scenes” blog series, designed to answer some frequently asked questions about how things work at Google Fiber. Today we’ll hear from Derek Slater, a Government Relations Manager at Google who works with the Fiber team, to explain how we work with local city governments to build a fiber network. - Ed. Provo: the wait for Google Fiber is (almost) over! and let gigabit Internet flow to the “Silicon Slopes” — starting today, several thousand Provo residents (residential customers of the local Veracity Networks) can start signing up for Google Fiber. Sign-ups for the rest of Provo residents will open in January. This sign-up process is different (and faster) in Provo than in Kansas City and Austin because our construction process is different. In KC and Austin, we need to install thousands of miles of brand new fiber-optic cables, which requires many months of planning, engineering and construction before we can open sign-ups and bring service to customers. Here in Provo, we purchased the iProvo network from the City of Provo, so a lot of this network already exists — we just needed to upgrade it to make it faster. Veracity customers get the first crack at signing up for Fiber service — they’re already hooked up to our newly-upgraded fiber because they’ve been connected to the former iProvo network, so it will be efficient and quick to install Google Fiber for any of them who want to switch providers. This “first chance” opportunity is only for Veracity residential customers right now; other Provo residents and local small businesses can go to our website and sign-up to be notified when Fiber is coming to their area. If you’re a Veracity residential customer, this means you’re eligible for Google Fiber service, including an Internet connection that’s up to 100 times faster than basic broadband. All you have to do is go to google.com/fiber/provo, enter your address, and select which Google Fiber package (Gigabit Internet, Gigabit + TV, or Free Internet) you want. 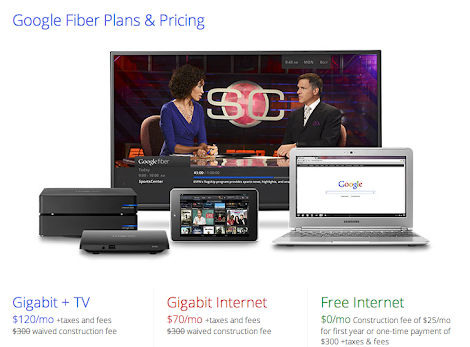 In order to get this early access to Google Fiber, make sure you sign up before October 31. This process is slightly different for those of you who live in apartment buildings or condos (what we call “Multi-Dwelling Units,” or MDUs). Since we need to bring Fiber to the entire building, the process takes a little longer. We are starting the conversations with landlords and property owners across the city. If you live in a building with 9 or more units, get in touch with your landlord and (1) tell them that you want Google Fiber, and (2) ask them to fill out this form. A member of our local Provo Fiber team will contact your landlord to discuss next steps on how to bring gigabit speed to your unit. Have questions? Confused about what this means for you? Just give us a call, email us or do an online chat with our customer service team. We’re here and ready to help, 24/7. It’s almost time to open the firehose and let gigabit Internet flow to the “Silicon Slopes” — starting today, several thousand Provo residents (residential customers of the local Veracity Networks) can start signing up for Google Fiber. Sign-ups for the rest of Provo residents will open in January. just became the newest Google Fiber city, following a vote at tonight’s city council meeting. We want to hook up Merriam residents as soon as possible, but we still need to plan our network and start construction before we can start installations. We’ll let you know when we’re ready to open signups here on our blog and via social media. Merriam, Kansas just became the newest Google Fiber city, following a vote at tonight’s city council meeting. We want to hook up Merriam residents as soon as possible, but we still need to plan our network and start construction before we can start installations. We’ll let you know when we’re ready to open signups here on our blog and via social media. , and we’re working hard to hit our goal of getting our first Google Fiber customers hooked up before the end of the year. Between now and October we’re focusing on a couple of key areas of work. First — and many might argue, most importantly — we’re working to upgrade the existing fiber network in Provo to be Gigabit-ready. Secondly, we’re spending a lot of time talking with property managers and owners of large apartment building and condominiums. Planning for and installing Google Fiber in these big buildings takes a lot of time, so if you manage a building with 5 or more units, we’d love to start chatting with you now — please get in touch with us! Free Internet. Get today’s basic broadband speeds (up to 5 Mbps download, 1 Mbps upload) for free for at least the next seven years. Gigabit Internet. Connect to the web at speeds up to 100 times faster than basic broadband (up to 1 Gbps download and upload) for $70/month. Gigabit Internet + TV. Get 100 times faster Internet plus hundreds of HD channels. Record up to 8 shows at once and store up to 500 hours of HD content on your Storage Box for $120/month. Each of these plans will require a one-time $30 construction fee which you’ll pay when you choose your plan (for single family homes) or your landlord will pay after they sign an agreement with us to wire up your apartment/condo. For current Veracity customers in single-family homes — we want you to know that nothing changes for you yet. You can continue to use your service as you do today. Later this year, you’ll have the option of becoming a Google Fiber customer and the option to sign up for any of the services listed above. To stay up to date on any new developments, you can sign up for our Provo email list on our website. Thanks for all of the interest; we’ll talk more in the fall! In July, we completed our agreement with the City of Provo, and we’re working hard to hit our goal of getting our first Google Fiber customers hooked up before the end of the year. Between now and October we’re focusing on a couple of key areas of work. right on our Fiber TV Box. VUDU is an on-demand video service that subscribers can use to rent or purchase movies and TV shows — and combined with Netflix and our Google Fiber Video on Demand Library, Google Fiber customers now have access to one of the largest on-demand collections of movies and TV Shows. You can access all of this great content under the “More tab on our TV menu. We’re also updating the Google Fiber mobile app to support VUDU — now it will be easier than ever to search for, discover and watch thousands of movies and shows on your Android or iPhone. If you’re looking for a specific movie or TV show to watch tonight, chances are increasingly good that you’ll be able to find it using your Google Fiber TV service. Yesterday, we launched VUDU right on our Fiber TV Box. VUDU is an on-demand video service that subscribers can use to rent or purchase movies and TV shows — and combined with Netflix and our Google Fiber Video on Demand Library, Google Fiber customers now have access to one of the largest on-demand collections of movies and TV Shows. You can access all of this great content under the “More tab on our TV menu. , on behalf of several local funders including Google Fiber and the Sprint Foundation, announced a brand-new fund aimed at closing the digital divide here in Kansas City. The Kansas City Digital Inclusion Fund will support local nonprofits and community organizations that will help Kansas City residents learn about and take full advantage of the web. 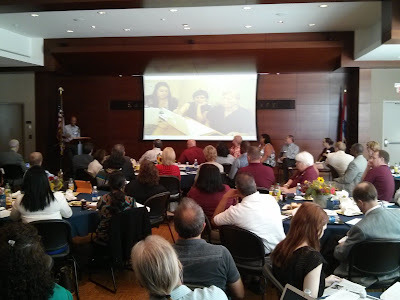 Leaders of successful digital inclusion projects in other cities joined Kansas City nonprofit leaders to share lessons learned in their work. We’re proud to be one of many local supporters of this first-of-its-kind grant program in Kansas City. As we’ve worked throughout the community, we’ve heard some incredible ideas from nonprofits and leaders who want to do amazing things to increase digital literacy in KC. We’ve also heard from them that they need more resources (funding, computers, staffers, etc.) to execute and scale their work. Now, these community groups can apply for grants to fund their work to help Kansas Citians get online; get access to more affordable computers; learn how to apply for jobs; teach kids how to do research on the web; teach classes on how to compare health care options online and much more. We know Kansas City nonprofits have what it takes to make a big impact, and we can’t wait to see what projects they come up with. If you’re a local nonprofit, you can apply now, or attend one of the upcoming informational sessions (listed below). Grant applications are due before 5 p.m. CST on September 27, and recipients will be announced in early November. This morning, the Greater Kansas City Community Foundation, on behalf of several local funders including Google Fiber and the Sprint Foundation, announced a brand-new fund aimed at closing the digital divide here in Kansas City. The Kansas City Digital Inclusion Fund will support local nonprofits and community organizations that will help Kansas City residents learn about and take full advantage of the web. Fiber for Prairie Village, Kan.
City Council voted to bring Fiber to their city. Prairie Village residents have been asking for Fiber for awhile, and we can’t wait to bring it to them in the future; as soon as we have more information about timing, we’ll post it right here. Tonight, the Prairie Village, Kansas City Council voted to bring Fiber to their city. Prairie Village residents have been asking for Fiber for awhile, and we can’t wait to bring it to them in the future; as soon as we have more information about timing, we’ll post it right here. out and about in KC. New books, new classrooms, new teachers, new subjects—and a new ultra fast Internet connection! This year, you can help your kids learn at home by signing up for Google Fiber and giving them access to the Internet at speeds that are up to 100 times faster than today’s average broadband. Today, we’re announcing new deadlines for twenty-eight more fiberhoods. If you live in one of the fiberhoods listed below, visit our website ASAP to choose your Fiber plan. If you’re not sure which plan is right for you, drop by the Fiber Space or check out our Mobile Google Fiber Space out and about in KC. You can sign up for the Sports Plus package starting now. If you already have Fiber service installed in your home, you can call customer service 24/7 at 877-777-7550 to have the package added. Folks who don’t have Fiber yet can sign up for the package on our website. The MLB is racing towards the postseason, the NFL preseason kicks off this weekend, and college football teams across America are hitting the practice fields. In other words, it’s almost the (arguably) best season for sports, and we’re ready to give you access to all of the sports content you can watch. Today, we’re launching our new Sports Plus package, currently featuring 12 networks all for $10/month (plus tax). The Sports Plus package options and pricing will vary slightly depending on which Fiber city you live in. Regardless, we’ll have you covered, whether you fancy fishing, fighting, football, fútbol, fastballs or almost anything in between. This morning, 50 Kansas City middle and high school students met the First Lady of the United States — via a Google Fiber connection at the Fiber Space. All week, Mrs. Obama has been traveling on a White House Tour through Africa, talking to and hearing from young people about the importance of education. Today, she heard from students right here in KC. 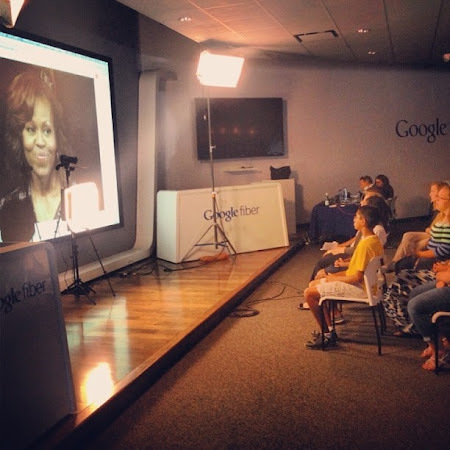 At 8:30 a.m. Central Time, the First Lady hosted a Google+ Hangout On Air from Johannesburg, South Africa connecting to students in L.A., Houston, New York, and Kansas City. The students and Mrs. Obama got the chance to talk with one another directly, sharing ideas about education in their countries face-to-face-to-face; a bit like a 21st-Century pen pal program. The group of KC students that "met" the First Lady are spending their summer breaks building motors, programming robots and developing web and mobile apps; they’re students who are attending several KC STEM Alliance camps to learn about science, technology, engineering and math. You can see the whole video from the event here. Many thanks to the KC STEM Alliance, the Office of the First Lady and all of our STEM campers for letting us be a part of this transatlantic discussion. was a key stop for wagoners moving west along the Santa Fe Trail. Now, more than a century later, Mission will become a hub for another expansion — the growth of the Silicon Prairie. Tonight, Mission’s city council voted to bring Google Fiber to Mission citizens. We’re not sure when we’ll be able to bring Fiber to Mission (we have a lot of work to do before that can happen), but we’ll be sure to post any updates right here. In the late 1800’s, Mission, Kansas was a key stop for wagoners moving west along the Santa Fe Trail. Now, more than a century later, Mission will become a hub for another expansion — the growth of the Silicon Prairie. Tonight, Mission’s city council voted to bring Google Fiber to Mission citizens. City Council just voted to bring Fiber to their town! For those of you keeping count, that’s nine Kansas City-area cities (in addition to Kansas City, Kan. and Kansas City, Mo.) where we plan to build Fiber in the future. You can see them all mapped out here. As soon as we have more information about when Fiber will come to Lee's Summit residents, we’ll share it on this blog. The Lee’s Summit, Missouri City Council just voted to bring Fiber to their town! For those of you keeping count, that’s nine Kansas City-area cities (in addition to Kansas City, Kan. and Kansas City, Mo.) where we plan to build Fiber in the future. You can see them all mapped out here. soon so we don’t miss you during construction. If you’re not sure which plan is right for you and want to talk to a person, drop by the Fiber Space or give us a call—we’re always happy to help! If you pre-registered for Fiber last fall, we know you’ve been waiting awhile for Fiber to come to your area. We’re working hard to get to you as quickly as possible; as of today, customers in 16 fiberhoods throughout KCK and KCMO have Fiber service. And today, we’re drawing closer to bringing Fiber to 11 more fiberhoods. If you live in any of these fiberhoods, be sure to choose your Fiber plan soon so we don’t miss you during construction. If you’re not sure which plan is right for you and want to talk to a person, drop by the Fiber Space or give us a call—we’re always happy to help! Thirteen-year-old Kansas City-area resident Nick LeGrande has been a baseball fan since he can remember. He loves to watch baseball, talk about baseball, and of course, play baseball. But last year, Nick was diagnosed with severe aplastic anemia, a rare blood disease that has kept him off the field indefinitely. When the Oakland A’s, a Major League Baseball team, heard about Nick’s situation earlier this year, they asked him to throw out the first pitch at tonight’s game. Because of his illness, Nick can’t hop on a plane for the 1,800 mile journey from Missouri to the A’s stadium in California. But luckily, there’s another way for Nick to throw out tonight’s ceremonial pitch — using the Internet. When we think of the power of the Internet and the importance of broadband connectivity to our communities, it’s easy to just think of sending email or watching videos. But high-bandwidth applications on the web have made a host of other amazing things possible — for example, the field of telerobotics, or the ability to control robots over long distances using the web. That’s how tonight, using a specially-designed, web-connected pitching robot, Nick LeGrande will throw the first-ever telerobotic pitch in MLB history. At 8:53 PM Central time, Nick will join us at the Google Fiber Space in Kansas City, which we’ve transformed into a mini baseball stadium (real grass, dirt and bleachers) for the occasion. Using an Android app, Nick will be able to control the movements of a robot that will sit on the pitcher’s mound in Oakland. That robot will be equipped with a camera, which will livestream a first-hand view of what the stadium looks like to Nick. Then, joined by his family, friends, teammates and doctors from Children’s Mercy Hospital, Nick will toss out the game’s first pitch — in Kansas City, and in Oakland. We're honored to share this moment with Nick, and you can too — visit our website to get a play-by-play of tonight's pitch and send him well-wishes via social media. He'll see your messages on the big screen at the Fiber Space as he throws out the first pitch. You can also visit Children's Mercy Hospital's website to learn more about Nick and severe aplastic anemia. This story is part of a series called “Why Speed Matters,” which showcases examples of what’s possible with fast Internet -- and why it matters. Ed. Note: You can help Nick and others with life-threatening illnesses with one quick cheek swab. Visit bethematch.org to become a donor. on Thursday, June 13 at 7:00PM. The episode won’t air on HBO until Sunday, June 16, so you’ll have a sneak peek of season six before all your friends. We expect this episode to be a nail-biter, so we’ve prepared some drink concoctions and munchies that you can sink your teeth into. Blood orange spritzer, anyone? RSVP now (seats are limited), and get there early to snag a swag bag. Our second premiere event next week focuses less on the supernatural and more on the natural. On Saturday, June 15 at 4:30PM, we’re screening the finale of Discovery’s North America series. In the finale, you’ll get an early look at North America: Top 10 — the show will feature the top 10 natural landmarks of the continent, as chosen by 35,000 online votes. RSVP now to save your seat. We'll have s’mores and some other snacks that remind you of being in nature, plus some photo opportunities with some of our favorite characters from the series. Vampires. Witches. Bison. Our lineup of guest appearances at the Fiber Space next week is different than what we’ve seen in the past. Here’s the scoop on the two premiere screenings we’re hosting. First up is the premiere screening of HBO’s True Blood on Thursday, June 13 at 7:00PM. The episode won’t air on HBO until Sunday, June 16, so you’ll have a sneak peek of season six before all your friends. We expect this episode to be a nail-biter, so we’ve prepared some drink concoctions and munchies that you can sink your teeth into. Blood orange spritzer, anyone? RSVP now (seats are limited), and get there early to snag a swag bag. There are also a few deadlines coming up in Kansas over the next few weeks—you can see the full list here. Nervous you’ll miss your deadline? Follow us on Google+, Facebook or Twitter where we post about upcoming deadlines and other cool stuff, too. If you’re in any of the following thirteen Missouri fiberhoods, we’ve just announced your sign up deadline—head over to our website to choose your Fiber plan. voted unanimously to bring Google Fiber to their city. Raytown is the tenth Kansas City-area expansion we’ve announced, and we hope to bring Fiber to more communities in the area, too. It will be awhile before we can hook up Raytown residents—we need to plan and build our network there first. When we have more info, we’ll be sure to post it here. Last night, the City Alderman in Raytown, Missouri voted unanimously to bring Google Fiber to their city. Raytown is the tenth Kansas City-area expansion we’ve announced, and we hope to bring Fiber to more communities in the area, too. voted to bring Google Fiber to their city. Shawnee, which is right outside of Kansas City, is known as a tight-knit community and a great place to do business. We’ve also been impressed by Shawnee’s vision to keep their citizens informed and involved using the Internet. Recently, the City modernized their website, so that locals can easily access city info—from crime maps to fiscal reports to streamed audio of city council meetings. This is a great example of how access to information via the web can help make communities stronger. Google Fiber—and widespread connectivity throughout Shawnee—will be a great complement to the great work the City is already doing. This evening, the Shawnee City Council voted to bring Google Fiber to their city. , it’s hard to go back to regular connectivity. We’ve heard this feedback a few times from our customers in Kansas City; it seems that some folks have become hesitant to leave their home connections. They want to be able to have access to Fiber even when they’re out and and about in KC, not just within the confines of their own home. So my team of engineers started thinking about possible solutions. How do you get a Gigabit everywhere in the community? We realized that the answer was all around us — utility poles. Poles already have our Fiber strung to them; all we had to do was come up with a way to make that Fiber accessible. That’s what we’ve done today. I’m happy to announce our newest project: Google Fiber Poles. It’s easy to get used to ultra-high speed Gigabit speeds. Websites load instantly, photos upload in seconds, and you never have to wait for web videos to buffer. That’s why, once you’ve used Google Fiber, it’s hard to go back to regular connectivity.